Simply put, all I need is my iPhone and earbuds (iBuds? earphones?) and that's it. I do have an Audible membership, but you can always download books from your local library as well. If something is on fire? I've listened to so many audiobooks that my commute anywhere is not right without a story filling my head. Right now, I'm listening to Sleeping Beauties by Stephen King and Owen Meany that was part of Ti's Book Chatter readalong and that I optimistically dove into but failed miserably to read while she was hosting it. Then, as my history would predict, once any readalong timeframe concludes, I jump into it only then, and with full enthusiasm. The main message is this: Try. Just try it out. 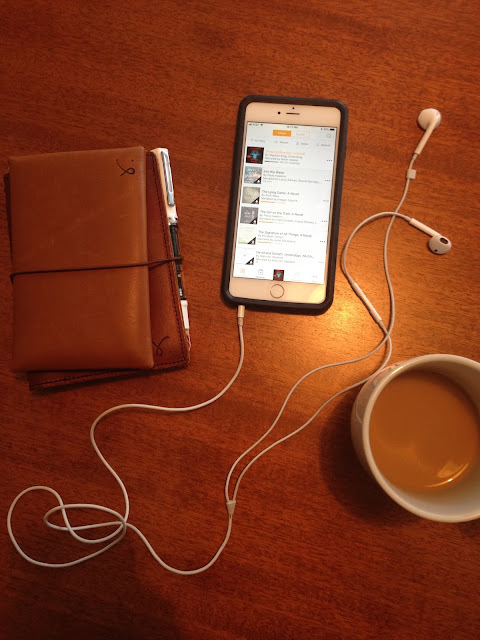 Find something that you think you might like and start listening to it while heading on a road trip or doing long errands and just pop it on. Don't get overly ambitious and first try with a thirty-four-hour audiobook; instead, pick something that has rave reviews for both story and performance, fitting in a genre you like, and pick something around eight to ten hours long, maximum. Something that would fit in your "wheelhouse," as we say in the corporate world, when most of us don't know what it means. Try. If you're not connecting to it, move onto something else. But always give it a shot just in case. You might be missing something that you end up truly loving. That was how it was for me. Now, I can't go a single day without at least five or ten minutes with a story. That is one habit I don't quite anticipate ever giving up. 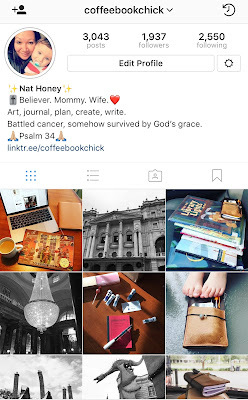 While safely tucked away on Instagram, which has become my comfy spot for life in general over the past few years, I have watched the book blogging world become quite a different space than when I lived in it. Sometimes it seems fun and supportive and happy, while other times it appears divisive, fragmented, different, an influx of new bloggers that I don't know, but I really miss this space. I'll pop up a quick micro review on Instagram once in a very great while, and that's about it, but I miss this corner. I want to see if I can return, to poke my head out onto the blacktop and see if there's anyone else who wants to play hopscotch again? I want to defy all differences of negativity for the very sake of nostalgia and missing my fellow book bloggers. And while I realize life also happened for me over the past few years, I still feel downtrodden when I click on a friend's blog site and I see they may not have posted in as many years or as many times throughout our respective absences. It's weird, this once so crucial part of my existence, something that I would feel more likely to lead off with in conversation when introducing myself (Hi, I'm Natalie, I am a book blogger.) I say nothing about my real day job because I never felt that defined me. It pays my bills but is not quite at all a dream. Book blogging, on the other hand, very much so was something I felt that defined me to an extent. It was something I was proud of, a hobby that seemed more than that, something that I loved talking about. And now that all that cancer junk is behind me, I want the book blogging fellowship feeling back again. I don't know what this new landscape of reading and reviewing looks like, but I want to peek a little into the universe of it all again to see if I feel like my feet feel secure. I want to talk about my life after Stage 3 breast cancer, how I went through chemo and radiation and had no hair for six months, and how while I know it's firmly in my rear view mirror, I'm still always terrified. I want to talk about my son who was only 7 months old when I was diagnosed and how I have so many pictures where he had more hair than me, and the times when he only recognized me for my bald head and never knew who "she" was when I showed him pictures from BEFORE. There's so much LIFE out there. So much to see and do. I want to find that new routine, not just in the world of Instagram, but back in this corner, with all of you, celebrating life. I hope many of you still remain. I hope I can be consistent. Part of me wants to talk about everything here, and part of me thinks staying on Instagram is the best place for me. I'm not sure yet. But I wanted to throw my hat in the ring to declare that it wasn't quite over for the Coffee and a Book Chick and her little ole book blog. Not just yet. Oftentimes, I've wondered where the children's books are that not only will keep my son engaged, but also will maintain my enthusiasm to read it over and over and over (and over!) again.They are out there, naturally, but as a first-time mother, I'd feel a sinking sense of overwhelming fear when navigating through a children's book section, unsure of how to look for something, or even what I was looking for. With the teeny tiny tots of all ages bursting from long aisles, toys askew on the carpets, and parents on cell phones who just need that "break," it added to the insurmountable feeling of my own confusion. I usually jumped on board with all of the very well known book titles, but some of those just didn't stick, or were a disappointment. My son is almost four-years-old now and it has been extremely frustrating that for me, a life-long reader, to figure out exactly what "level" we should be reading at and what he "should" be enjoying has been a moving target. Comparison might be key for understanding overall development, but at some point in a school, or even unintentionally between moms, it becomes downright judgy. Every child is different. Every child verbalizes their emotions and feelings in unique ways that only their primary caregiver understands, who can translate and just "get it." Each child is different in which television show to watch, and it may be completely different than what most kids prefer. Every kid I know loves SpongeBob. I think SpongeBob is funny. My kid? Meh. It's okay. But the look on people's faces when you reveal that something wildly popular isn't of interest to him is received with shock and shakes of heads at times. Don't get me wrong, my son loves many a catchy show (Blues Clues! Transformers! Captain America and Iron Man). But my kid is not better than your kid. And your kid is not better than mine. Right? Everyone learns differently, both through books, television, and socially. So back to my confusion... I found myself wandering in the library again. Here I am, a book blogger of seven years, and I felt overwhelmed in a library? Or in the kids' section of a major bookstore? This cannot be. But I was. And then one day, pregnant several months with Dominic, I was walking through a bookstore. By simple chance I happened upon a table that had books sorted all over in no particular order and I saw the cover of the book that immediately sparked my interested. And it was then that I remembered a fellow blogger had reviewed it years before. I cannot recall her name or site now, but should she still be out there and happen to read this, a BIG thank you goes to you. Thank you for writing a review so filled with passion and love for this book that I bought it the second I saw it in the store when my son was still just growing inside me, that I bought without even reading it or scanning through it. I never even really knew the story because I bought it only because of her review. It became a book I easily kept separate through my son's "I-rip-everything-to-shreds" baby stages, and then finally one night, when cleaning out a guest bedroom closet, I came across a stack of books and saw it at the top and immediately thought, "Oh! Here it is! I always wanted to read this!" 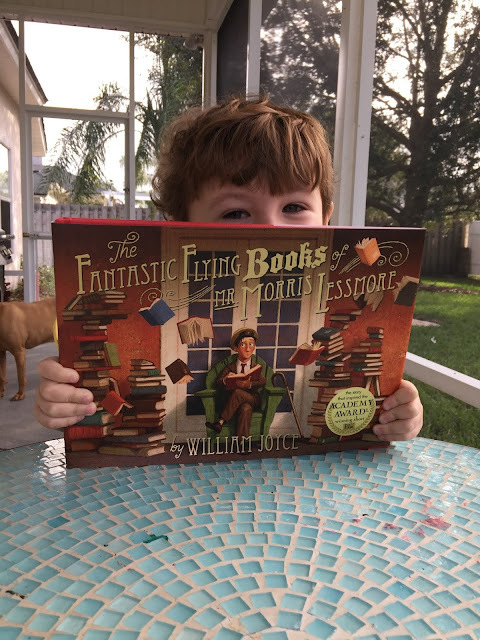 That night, I read The Fantastic Flying Books of Mr. Morris Lessmore by William Joyce and illustrated by William Joyce and Joe Bluhm for the very first time for me, and to my son, and I got so emotional at the end that I choked up and my eyes did the typical prick at the corners for slight tears. The beautiful imagination of the story, the imagery and characters so heartwarming and expectant, full of life and journeys and secrets within the book that my son will come to understand when he gets older, combined with the curiously delightful and beautiful illustration, completely touched my heart to its very core. 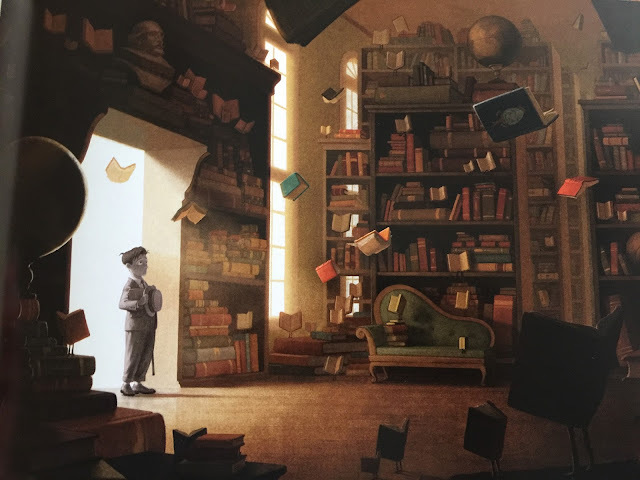 Mr. Morris Lessmore, a quiet writer, suffers a devastating loss but is saved by a room filled with flying books that he tends to and cares for throughout his entire life. I turned the very last page and looked down at my son and found to my excited relief, that his eyes were wide and that he actually loved it, that he was just as entranced as I was by the tale of a man who lived his whole life among flying books in the library of his own world. I have read it every single night for two weeks to Dominic, and it has not grown old for either of us. To the book blogger who wrote that review from four or so years ago - again, thank you. I truly hope I can give that book the same justice of a heart-touching review which encourages all who read this to buy it for their child, or to set it aside as a holiday gift to a friend or family. It will be entirely worth it. There is even a short 15-minute film available on YouTube from MoonBot Studios and it is every bit as beautiful as I had hoped. I highly recommend you read the book first, of course, and then especially read the jacket with the author's description and the reason why he wrote it. It makes the story even more of, well, just everything amazing and good. I will constantly be on the hunt for more of these stories. Do you have one that is every bit as enthralling, compelling and heartwarming? Drop your recommendation in the comments below, and I thank you kindly in advance. 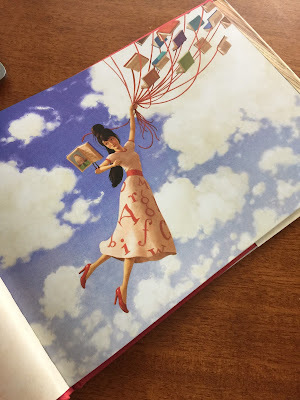 Joe Bluhm is an illustrator known for several incredible books including the work done on The Fantastic Flying Books of Mr. Morris Lessmore, and he has a new book coming out in 2018! Visit the Illustrator on his blog.